Right now our organisations and institutions need leaders and leadership not just managers and management. Yet management is widely distributed and leadership is rare. And, most of what passes for leadership education and training is not fit for purpose. What is the basis of my assertion? When reading through leadership material (books, courses…) I am struck by an experience I had some years ago. The challenge in coming into the organisation was to build the capability of the organisation to sell and deliver data mining/customer analytics services. This meant getting to grips with the customer analytics training course. As I read the course material and talked with people who had taken the course my heart sank. Why? Because the course was all to do with theory and such left the participants with a bag full of concepts. And absolutely no hands on experience in doing data mining and building predictive models. As I result I spent three months designing/writing a new course from scratch: a course designed to leave the participants with the experience of being data miners / predictive model builders. In short, too many leadership courses espouse theory rather than call forth the participants to be leaders and exercise leadership. Hence, in this series of posts I am going to share the work of Werner Erhard et al on the ontological model of leadership. Having participated in a similar course (SELP), I can say there is no substitute for doing the work that is necessary to show up as leader. The work is not easy – struggle with self and one’s existing way of being is necessary – and that is what makes it valuable. So in this blog series I can only shares the distinctions and point out the direction. Let’s start. What are the 3 foundational strands of the ontological model of leadership? The three foundational elements are integrity, authenticity and being committed to something bigger than oneself. What is Werner pointing at when he speaks integrity? Here is my take on it. He is pointing at integrity as the state of being whole and complete. That is to say words and behaviour are in perfect alignment. What is the access to being in integrity? “honouring one’s word”. Notice that “honouring one’s word” is distinct from “keeping ones word”. What is the difference? Has the lack of ‘Integrity’ and authentic leadership compromised the ‘workability’ and performance of the West? In the next post, in this series, I will explore “authenticity”. 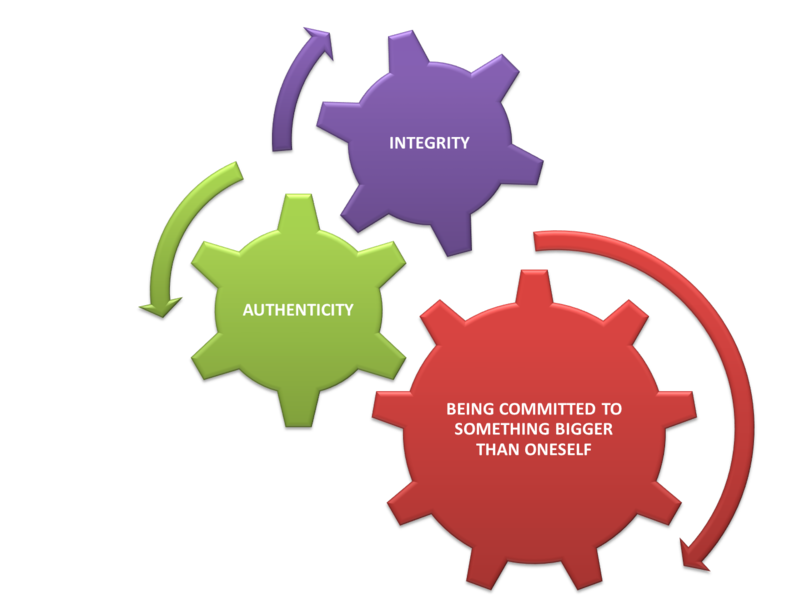 Authenticity is critical to leadership and so I have put it in the centre of the diagram (above). One of the points it made was that people do what ever they think is the best thing they could do for them at any given moment. They evaluate their choices and pick the best one. Assuming it is a good idea, why would anybody not show integrity. What is going through their minds, and what experiences have they had that makes them think it s a bad idea? Interesting questions: why would anybody not show integrity? What is going through their minds? And what experiences make them think it is a bad idea? If we move away from the mental model of mind that is fashionable then I think we have a clue. We are thrust in the world and we absorb and become one with the existing way of doing this – the existing practices of our family, our community, our culture. Put differently we are the practices of our culture. I know that sounds radical and I invite you to take a look at it. So my answer is that nothing goes through people’s minds. The vast majority of us are simply on automatic pilot. We simply do that which we have been doing for a long, long time. And what we do is inauthentic. Mum and dad espouse one set of edicts and live another. And they do not like being called on it. Teachers do the same and so forth. The default way of being is being out of integrity. It takes something to be ‘in integrity’. Why? Because it does. Until you have practiced it enough so that it becomes second nature. Finally, there is no social reward for being in integrity. And our whole way of being is based on being rewarded. I share your frustration with management training, where much of it is abstract and of little use. I would also add that firms send their people on management courses, get them all trained up in ‘management’ and then expect them to lead. Dearest Maz. I enjoy your posts, specially when you comment about leadership and “human resources”. I am thinking that this subject (leadership) should be our next interview in my Brazilian magazine. My editior loved the idea!! What do you think? I am thinking to publish it in March 2013. Great to hear from you, I hope that you are well. Yes, I am up for that as the subject of leadership and people is close to my heart and a key concern for any and all organisations. When do you want to start? Dear, I would like to start soon, but It’s much better after you finish your posts about this subject. This way, I can prepare some questions about your ideas as well. Next week I will know if I can travel to Germany in January for a job – If yes, I intend to go to London also and meet you – but at the moment I don’t know if is possible. The other way, we can make like before: I prepare my questions and send to you. It’s always a pleasure talk to you. I admire your articles (blogs). Really, they are very interesting and can help our companies too! Congratulations! Being selfish I hope that you will make it to London and we will meet. As and when you do make it here, I invite you to my home, to meet my family, to eat with us…. As for the article, I am happy to work with you on the way that works best for you. I am not in a hurry to get anywhere. The Customer Blog, is a vehicle for me to put something into the game of life and business. And in the process I get self-expression and even the opportunity to ‘meet’ fabulous human beings like yourself and generate friendships across the world. What bigger reward is there? Be well, be great and know that you have touched my life and I think of you and wish you well.